Riverwatch has been fortunate in obtaining Federal Government support and funding of approximately $120,000 over the years. This funding covered work such as the Smart Floodgate and the Foreshore Definition study. More recently Riverwatch received an OceanWatch grant of $3,650 in 2012 to assist with the purchase of a trailer for our new boat. The support given to Riverwatch over the years from our Federal Government representatives in the electorate of Gilmore is greatly appreciated. On 18 April 2013 Riverwatch hosted a river trip for the Ministers to view bank restoration work and banks needing urgent repairs. Minister Hunt announced that bank restoration at Bolong would be a high priority for a Green Army project. (see press release). "A re-elected Turnbull Government will provide $300,000 to stabilise the Shoalhaven River embankment near Bolong Road under the Improving Your Local Parks and Environment Program. The investment is part of the Coalition’s policy to support local communities and environments by investing in parks, nature reserves, coastal and river area." Since the election, in which the local member was successful, Riverwatch has lobbied and been successful in obtaining the funding for Shoalhaven City Council to undertaken the stabilisation. The project should be completed in 2019 with the heavy construction work being undertaken in 2018. Riverwatch will assist the Council in providing volunteers to undertaken some sand sausage construction and planting of mangroves. Riverwatch has a long association with the NSW State Government ranging from seeking funding for river rehabilitation to management and boating plans for the river. Funding between 2001 and 2018 amounted to approximately $241,000. The majority of funding was for bank restoration work. While the names of the Government agencies have changed, associations have been established with environmental, fisheries, water, catchment and crown land authorities. 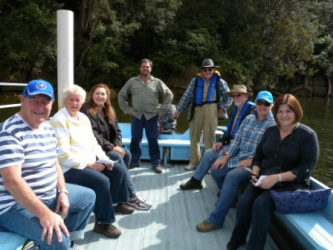 With the creation of the NSW Catchments Management Authorities in 2003, Riverwatch had a close working relationship with the staff from the Nowra office of the Southern Rivers Catchment Management Authority (SRCMA). Working in partnership with the SRCMA, Riverwatch has been able to undertake large scale bank restoration work, which was really impossible prior to the establishment of the SRCMA. The SRCMA has now been replaced by NSW Local Land Services (LLS). Click LLS to see their website and click Media Items - Governments to see SRCMA and LLS projects in which we have been involved. Riverwatch appreciates the support from our State Government representatives in the electorates of Kiama and Shoalhaven as well as the support given to us from staff within the various State Government departments. On 11 Feb 2014, Riverwatch had a meeting with Minister Parker to discuss our work. The meeting came after the Minister’s office requested a meeting with Riverwatch through the office of Shelley Hancock. The Minister was extremely interested in the bank restoration work on Numbaa and Numbaa Island as well as the serious erosion at Bolong. The Minister does have discretionary funding up to $5000 for minor projects. After submitting our proposal, Riverwatch was successful in obtaining some funds to continue our bank restoration work. Representation by Riverwatch on natural resource Committees concerning the Shoalhaven River has been possible for many years. This has enable Riverwatch to have an input, although limited, to the development of Council's policy of the Shoalhaven estuary, including the drafting of a Shoalhaven River Estuary Management Plan (SREMP). While Council highlights the importance of the Shoalhaven River for tourism, Council's desire to implement many of the actions of the Shoalhaven River Estuary Management Plan (SREMP) and recognize the impact of unplanned recreational boating activity on the river system has been disappointing. Riverwatch has always strived to have a good working relationship with Council, and the newly elected Council is now taking an active role in addressing the issues of the River environment. Riverwatch is keen to foster and increase this relationship with Shoalhaven Council. River Cruise on the Riverwatch Boat in November 2012. Representatives inspect bank restoration work and planning for a new strategic management plan for the Shoalhaven River to improve river health and reduce pollution and bank erosion. Shelley Hancock: State Member of Parliament.